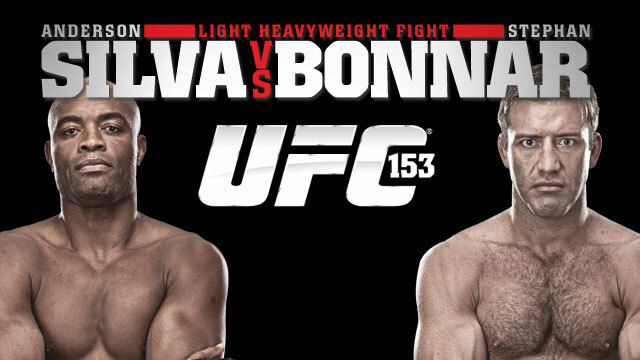 UFC 153: Silva vs. Bonnar Fight Pick & Preview | MMA Fighting Events Videos Techniques UFC Fight Picks and News. The UFC (Ultimate Fighting Championship) returns this Saturday with UFC 153 from Rio de Janeiro, Brazil. In an odd move by the UFC, the main event will feature UFC middleweight champion, Anderson "The Spider" Silva, versus light heavyweight journeyman Stephan "The American Psycho" Bonnar. Silva has very little to gain, and a lot to lose by stepping up a weight class and fighting Bonnar. In any case, I've picked 9 UFC main event winners in a row, and I'm not planning on getting this one wrong. Let's take a closer look at the fighters, and I'll make my fight pick. Anderson "The Spider" Silva has dominated the middleweight division since his first fight in the UFC way back in June of 2006. In the UFC, he's won 15 straight without a loss and sports an overall MMA record of 32-4. Silva had a stint where he became very defensive and his fights were a bit boring, but he's picked up the pace of late, and has finished his last 4 opponents with 3 KO/TKOs and one submission. Anderson Silva has a lot of tools and weapons in his MMA arsenal, but his deadliest is his pinpoint striking accuracy. If Stephan Bonnar plans on winning, he's going to have to solve that puzzle, but it won't be an easy task as other fighters have tried and failed. Most MMA experts would agree that Stephan Bonnar is being fed to Silva as a test fight at light heavyweight, possibly to set up a super fight with Jon "Bones" Jones. Bonnar has had his ups and downs in the UFC and has become somewhat of a journeyman and gatekeeper in the light heavyweight division. He has an overall record of 15-7, but he has won his last three fights. While three wins in a row looks good, it hasn't been against the best competition. Kyle Kingsbury, Igor Pokrajac, and Krzysztof Soszynski weren't exactly the cream of the crop in the UFC's light heavyweight division. In any case, a win is a win and Bonnar is a gritty fighter that can hold his own. In his 22 MMA fights, he's only been stopped twice (TKO's). He also has a fight were he went the distance with current light heavyweight champ Jon "Bones" Jones. Unfortunately for Bonnar, holding your own and winning a fight are two different things. I don't think he has enough in his MMA arsenal to do what it takes to win versus Silva. Look for Silva to pick his spots, and pick Bonnar apart with his pinpoint accuracy.